This article is about the modern town in Israel. For the nearby ancient city, see Caesarea Maritima. For the city in Turkey, see Kayseri. For other uses, see Caesarea (disambiguation). Caesarea (Hebrew: קֵיסָרְיָה, Keysariya or Qesarya; Arabic: قيسارية‎, Qaysaria; /ˌsɛzəˈriːə, ˌsɛsəˈriːə, ˌsiːzəˈriːə/) is a town in north-central Israel, which inherits its name and much of its territory from the ancient city of Caesarea Maritima (Greek: Καισάρεια). 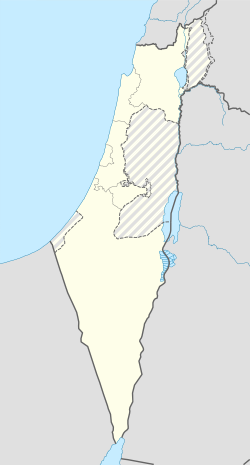 Located midway between Tel Aviv and Haifa on the coastal plain near the city of Hadera, it falls under the jurisdiction of Hof HaCarmel Regional Council. With a population of 5,127, it is the only Israeli locality managed by a private organization, the Caesarea Development Corporation, and also one of the most populous localities not recognized as a local council. 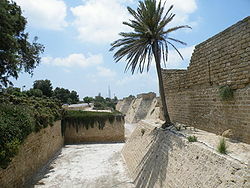 The ancient town was built by Herod the Great about 25–13 BCE as the port city Caesarea Maritima. It served as an administrative center of Judaea Province of the Roman Empire, and later as the capital of the Byzantine Palaestina Prima province. Following the Muslim conquest in the 7th century, in which it was the last city of the Holy Land to fall to the Arabs, the city had an Arab majority until Crusader conquest. It was diminished after the Mamluk conquest. In 1884, Bosniak immigrants settled there establishing a small fishing village. In 1940, kibbutz Sdot Yam was established next to the village. In February 1948 the Bosniak village was conquered by a Palmach unit commanded by Yitzhak Rabin, its people already having fled following an attack by the Lehi. In 1952, the modern Jewish town of Keisariya was established near the ruins of the old city, which were made into the national park of Caesarea Maritima. Caesarea Maritima was built in Roman-ruled Judea under the Jewish client king Herod the Great during c. 20–10 BCE near the ruins of a small naval station known as Stratonos pyrgos (Straton's Tower), founded by Straton I of Sidon. It was likely an agricultural storehouse station in its earliest configuration. In 90 BCE, Alexander Jannaeus captured Straton's Tower as part of his policy of developing the shipbuilding industry and enlarging the Hasmonean kingdom. Straton's Tower remained a Jewish settlement for two more generations, until the area became dominated by the Romans in 63 BCE, when they declared it an autonomous city. The pagan city underwent vast changes under Herod the Great, who renamed it Caesarea in honour of the Roman emperor, Caesar Augustus. In 22 BCE, Herod began construction of a deep sea harbor and built storerooms, markets, wide roads, baths, temples to Rome and Augustus, and imposing public buildings. Every five years the city hosted major sports competitions, gladiator games, and theatrical productions in its theatre overlooking the Mediterranean Sea. When Judea became a Roman province, Caesarea Maritima served as its capital. In the 3rd century, Jewish sages exempted the city from Jewish law, or Halakha, as by this time the majority of the inhabitants were non-Jewish. The city was chiefly a commercial centre relying on trade. The Sacro Catino, a bowl made from green Egyptian glass, later identified as the Holy Grail, brought from Caesarea to Genoa by Guglielmo Embriaco in 1101. The Muslim historian al-Biladhuri (d. 892) mentions Kaisariyyah/Cæsarea as one of ten towns in Jund Filastin (military district of Palestine) conquered by the Muslim Rashidun army under 'Amr ibn al-'As's leadership during the 630s. The area was only seriously farmed during the Rashidun Caliphate period, apparently until the Crusader conquest in the eleventh century. Over time, the farms were buried under the sands shifting along the shores of the Mediterranean. Nasir-i-Khusraw noted a "beautiful Friday Mosque" in Caesarea in year 1047, "so situated that in its court you may sit and enjoy the view of all that is passing on the sea." This was converted into the church of St. Peter in Crusader times. A wall which may belong to this building has been identified in modern times. Khusraw further noted that it "is a fine city, with running waters, and palm-gardens, and orange and citron trees. Its walls are strong, and it has an iron gate. There are fountains that gush out within the city." The Arab geographer Yaqut, writing in the 1220s, named Kaisariyyah as one of the principal towns in Filastîn (Palestine). Caesarea was under Crusader control between 1101 and 1187 and again between 1191 and 1265. In 1251, Louis IX of France fortified the city, ordering the construction of high walls (parts of which are still standing) and a deep moat. However, strong walls could not keep out the sultan Baybars, who ordered his troops to scale the walls in several places simultaneously, enabling them to penetrate the city. During the Mamluk era, the ruins of Caesarea Maritima by the Crusader fortress near Caesarea on the Mediterranean coast lay uninhabited. Al-Dimashqi, writing around 1300, noted that Kaisariyyah belonged to the Kingdom of Ghazza (Gaza). In 1664, a settlement is mentioned consisting of 100 Moroccan families, and 7–8 Jewish ones. In the 18th century it again declined. In 1806, the German explorer Seetzen saw "Káisserérie" as a ruin occupied by some poor fishermen and their families. In 1870, Victor Guérin visited. Caesarea lay in ruins until the nineteenth century, when the village of Qisarya (Arabic: قيسارية‎, the Arabic name for Caesarea) was established in 1884 by Bushnaks (Bosniaks) – immigrants from Bosnia, who built a small fishing village on the ruins of the Crusader fortress on the coast. 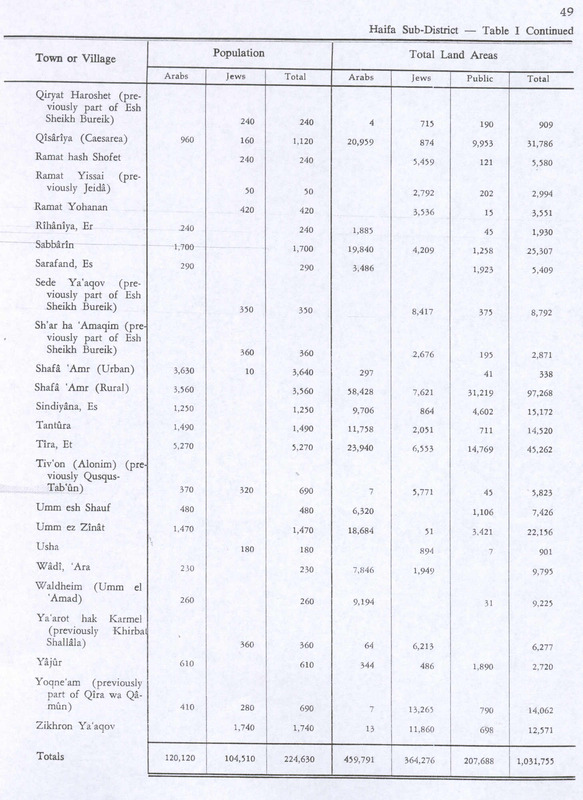 A population list from about 1887 showed that Caesarea had 670 Muslim inhabitants, in addition to 265 Muslim inhabitants, who were noted as "Bosniaks”. Petersen, visiting the place in 1992, writes that the nineteenth-century houses were built in blocks, generally one story high (with the exception of the house of the governor.) Some houses on the western side of the village, near the sea, have survived. There were a number of mosques in the village in the nineteenth century, but only one ("The Bosnian mosque") has survived. This mosque, located at the southern end of the city, next to the harbour, is described as a simple stone building with a red-tiled roof and a cylindrical minaret. It was used (in 1992) as a restaurant and as a gift shop. In the 1922 census of Palestine, conducted by the British Mandate authorities, Caesarea had a population of 346; 288 Muslims, 32 Christians and 26 Jews, where the Christians were 6 Orthodox, 3 Syrian Orthodox, 3 Roman Catholics, 4 Melkites, 2 Syrian Catholics and 14 Maronite. The population had increased in the 1931 census to 706; 19 Christians, 4 Druse and 683 Muslims, in a total of 143 houses. The Jewish kibbutz of Sdot Yam was established 1 kilometre (0.62 mi) south of the Muslim town in 1940. The Muslim village declined in economic importance and many of Qisarya's Muslim inhabitants left in the mid-1940s, when the British extended the Palestine Railways which bypassed the shallow-draft port. Qisarya had a population of 960 in 1945 statistics, with Qisarya's population composition 930 Muslims and 30 Christians in 1945. 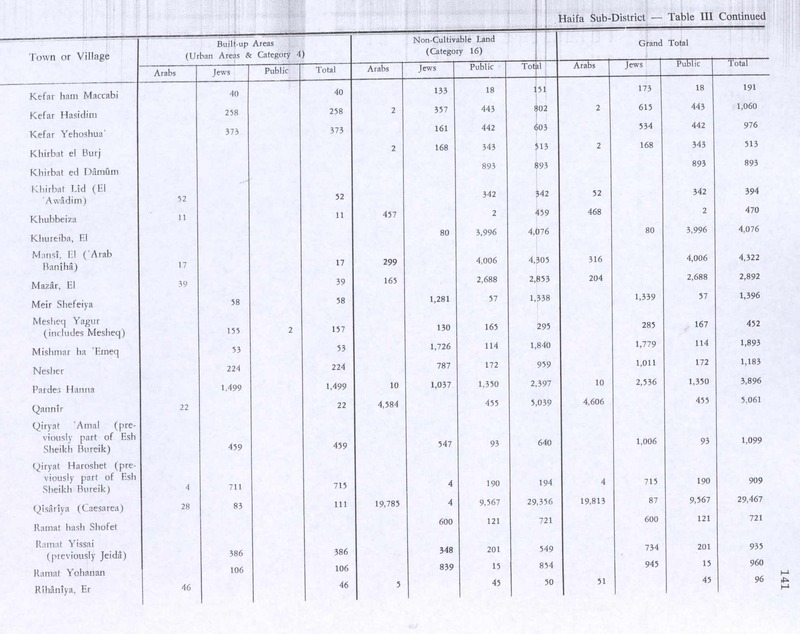 In 1944/45 a total of 18 dunums of Muslim village land was used for citrus and bananas, 1,020 dunums were used for cereals, while 108 dunums were irrigated or used for orchards, while 111 dunams were built-up (urban) land. The Civil War began on 30 November 1947. In December 1947 a village notable Tawfiq Kadkuda approached local Jews in an effort to establish a non-belligerency agreement. The 31 January 1948 Lehi attack on a bus leaving Qisarya, which killed two and injured six people, precipitated an evacuation of most of the population, who fled to nearby al-Tantura. The Haganah then occupied the village because the land was owned by Palestine Jewish Colonization Association, but, fearing that the British would force them to leave, decided to demolish the houses. This was done on February 19–20, after the remaining residents were expelled and the houses were looted. According to Benny Morris, the expulsion of the population had more to do with illegal Jewish immigration than the ongoing civil war. In the same month the 'Arab al Sufsafi and Saidun Bedouin, who inhabited the dunes between Qisarya and Pardes left the area. Palestinian historian Walid Khalidi described the village remains in 1992: "Most of the houses have been demolished. The site has been excavated in recent years, largely by Italian, American, and Israeli teams, and turned into a tourist area. Most of the few remaining houses are now restaurants, and the village mosque has been converted into a bar." After the establishment of the State of Israel, the Rothschild family agreed to transfer most of its land holdings to the new state. A different arrangement was reached for the 35,000 dunams of land the family owned in and around modern Caesarea: after turning over the land to the state, it was leased back (for a period of 200 years) to a new charitable foundation. In his will, Edmond James de Rothschild stipulated that this foundation would further education, arts and culture, and welfare in Israel. The Caesarea Edmond Benjamin de Rothschild Foundation was formed and run based on the funds generated by the sale of Caesarea land which the Foundation is responsible for maintaining. The Foundation is owned half by the Rothschild Family, and half by the State of Israel. The Rothschild Caesarea Foundation established the Caesarea Edmond Benjamin de Rothschild Development Corporation Ltd. (CDC) in 1952 to act as its operations arm. The company transfers all profits from the development of Caesarea to the Foundation, which in turn contributes to organizations that advance higher education and culture across Israel. Caesarea is located on the Israeli coastal plain, the historic land bridge between Europe, Asia and Africa approximately halfway between the major cities of Tel Aviv 45 kilometers (28 mi) and Haifa 45 kilometers (28 mi). Caesarea is situated approximately 5 kilometers (3 mi) northwest of the city of Hadera, and is bordered to the east by the Caesarea Industrial Zone and the city of Or Akiva. 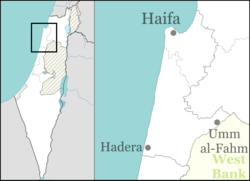 Directly to the north of Caesarea is the town of Jisr az-Zarqa. Caesarea is divided into a number of residential zones, known as clusters. The most recent of these to be constructed is Cluster 13, which, like all the clusters, is given a name: in this case, "The Golf Cluster", due to its close proximity to the Caesarea Golf Course. The golfcourse was built upon an ancient Arab town on the site of a loosely grouped Egyptian and subsequently Greek structures, with archaeological ruins. These neighborhoods are affluent, although they vary significantly in terms of average plot size. Most excavation that occurs in today's modern times began in 1950. The majority of the archeological excavations are done by the United States and Israel. A great deal of the work of excavating Caesarea, which continues every day, is done by volunteers while under the supervision of archeologists. Archeologists have been aware of the innumerable treasures beneath the city of Caesarea and its 1,300+-year history under many different conquerors. The unearthed treasures continue to provide answers to many unanswered questions about many historic civilizations. A rare, colorful mosaic bearing an inscription in Greek, dating from the 2nd-3rd century CE was uncovered at 2018, in the Caesarea National Park. It is one of the few extant examples of mosaics from the time period in Israel. According to the archaeologists, the mosaic measures 3.5 x 8 meters and is “of a rare high quality” comparable to that of Israel’s finest examples. In 2018, a significant hoard of 24 gold coins and a gold earring was unearthed and tentatively dated to 1101. Today, the Chairman of the Rothschild Caesarea Foundation and the CDC is Baron Benjamin de Rothschild, the great grandson of the Baron Edmond de Rothschild. Caesarea remains today the only locality in Israel managed by a private organization rather than a municipal government. As well as carrying out municipal services, the Caesarea Development Corporation markets plots for real-estate development, manages the nearby industrial park, and runs the Caesarea's golf course and country club, Israel's only 18-hole golf course. Caesarea is a suburban community with a number of residents commuting to work in Tel Aviv or Haifa. The Caesarea Business Park is on the fringe of the city. About 170 companies are in the park; they employ about 5,500 people. Industry in the park includes distribution and high-technology services. The residential neighborhoods have a shopping concourse with a newsagent, supermarket, optician, and bank. A number of restaurants and cafes are scattered across the town, with a number within the ancient port. Beyond the eastern boundary of the residential area of Caesarea is Highway 2, Israel's main highway linking Tel Aviv to Haifa. Caesarea is linked to the road by the Caesarea Interchange in the south, and Or Akiva Interchange in the center. Slightly further to the east lies Highway 4, providing more local links to Hadera, Binyamina, Zichron Yaakov, and the moshavim and kibbutzim of Emek Hefer. Highway 65 starts at the Caesarea Interchange and runs westwards into the Galilee and the cities of Pardes Hanna-Karkur, Umm al-Fahm, and Afula. Caesarea shares a railway station with nearby Pardes Hanna-Karkur, which is situated in the Caesarea Industrial Zone and is served by the suburban line between Binyamina and Tel Aviv, with two trains per hour. The Binyamina Railway Station, a major regional transfer station, is also located nearby. 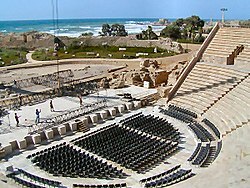 The Roman theatre, located at the site, often hosts concerts by major Israeli and international artists, such as Shlomo Artzi, Yehudit Ravitz, Mashina, Deep Purple, Björk, and others. In recent years, the port has become home to the annual Caesarea Jazz Festival, which offers three evenings of top-class jazz performances by leading international artists. 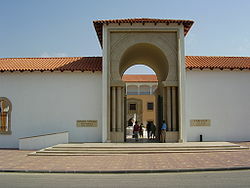 The Ralli Museum in Caesarea houses a large collection of South American art and several Salvador Dalí originals. Caesarea has the country's only full-sized golf course. The idea for the Caesarea Golf and Country Club originated after James de Rothschild was reminded by the dunes surrounding Caesarea of Scotland's sandy links golf courses. Upon his death, the James de Rothschild Foundation established the course. In 1958, a Golf Club Committee was established, and a course was built. American professional golfer Herman Barron, the first Jewish golfer to win a PGA Tour event, helped develop the course. It was officially opened in 1961 by Abba Eban. The Caesarea Golf Club has hosted international golf competitions every four years in the Maccabiah Games. The course was redesigned and rebuilt by golf course designer Pete Dye in 2007–2009. 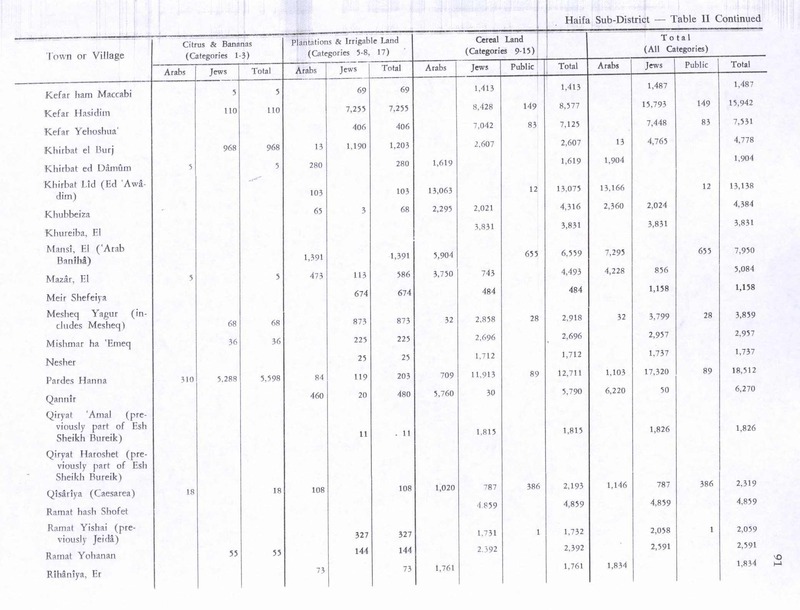 ^ a b "List of localities, in Alphabetical order" (PDF). Israel Central Bureau of Statistics. Retrieved 26 August 2018. ^ a b "Caesarea". Encyclopædia Britannica, Inc. Retrieved 26 September 2015. ^ Duane W. Roller and Robert L. Hohlfelder. "The Problem of the Location of Straton's Tower": 61–68. JSTOR 1356838. ^ Barber, 2004, p. 168. Mariti, 1792, p. 399. Marica, Patrizia, Museo del Tesoro Genoa, Italy (2007), 7–12. The object in question is a hexagonal bowl made from green glass, some 9 cm high and 33 cm across. It was seized and taken to Paris by Napoleon in 1805, and it was damaged when it was returned to Genoa in 1816. Apparently the object was not immediately identified as the Holy Grail, but it is described as an object with miraculous properties in 12th-century literature, including the Historia of William of Tyre. It is unambiguously identified as the Holy Grail in the 13th century, by Jacobus de Voragine. Juliette Wood, The Holy Grail: History and Legend (2012). ^ Morris, 2008, pp. 94–95. ^ "A Museum Renders Unto Caesarea". L.A.'s Natural History Museum. Retrieved 21 November 2017. ^ "Caesarea". Weizmann Institute. Archived from the original on 19 January 2008. Retrieved 26 January 2008. Abu Shama (d. 1267) (1969): Livre des deux jardins ("The Book of Two Gardens"). Recueil des Historiens des Croisades, Cited in Petersen (2001). Al-Baladhuri (1916). The origins of the Islamic state: being a translation from the Arabic, accompanied with annotations, geographic and historic notes of the Kitâb fitûh al-buldân of al-Imâm abu-l Abbâs Ahmad ibn-Jâbir al-Balâdhuri. Translator: Philip Khuri Hitti. New York: Columbia University. Ad, Uzi (9 May 2007). "Caesarea, The High Aqueduct in Nahal 'Ada" (119). Hadashot Arkheologiyot – Excavations and Surveys in Israel. Avner, Rita; Gendelman, Peter (30 January 2007). "Caesarea" (119). Hadashot Arkheologiyot – Excavations and Surveys in Israel. Barber, Richard W. (2004). The Holy Grail: imagination and belief. Harvard University Press. ISBN 0674013905. Crossan, J.D. (1999). Birth of Christianity: Discovering What Happened in the Years Immediately After the Execution of Christ. Continuum International Publishing Group. ISBN 0-567-08668-2. Gendelman, Peter (24 July 2011). "Caesarea" (123). Hadashot Arkheologiyot – Excavations and Surveys in Israel. Gendelman, Peter; Massarwa, Abdallah (15 August 2011). "Caesarea, Sand Dunes (South)" (123). Hadashot Arkheologiyot – Excavations and Surveys in Israel. Levine, Lee I (1975). Caesarea under Roman rule. Brill Archive. ISBN 978-90-04-04013-7. Retrieved 10 March 2010. Meyers, E.M. (1999). ""The Fall of Caesarea Maritima"". Galilee Through the Centuries. Eisenbrauns. ISBN 157506040X. Morris, B. (2008). 1948: A History of the First Arab-Israeli War. Yale University Press. ISBN 978-0-300-12696-9. Oliphant, L. (1887). Haifa, or Life in Modern Palestine. archive.org. Oren, Eliran (1 June 2010). "Caesarea" (122). Hadashot Arkheologiyot – Excavations and Surveys in Israel. Porat, Yosef (31 May 2004). "Caesarea" (116). Hadashot Arkheologiyot – Excavations and Surveys in Israel. Ringel, Joseph (1975). Césarée de Palestine: étude historique et archéologique (in French). Éditions Ophrys, University of California. Safrai, Z. (1994). The Economy of Roman Palestine. Routledge. ISBN 0-415-10243-X. Sa‘id, Kareem (22 May 2006). "Caesarea" (116). Hadashot Arkheologiyot – Excavations and Surveys in Israel. Sa‘id, Kareem (10 July 2007). "Caesarea" (119). Hadashot Arkheologiyot – Excavations and Surveys in Israel. Seetzen, U.J. (1854). Ulrich Jasper Seetzen's Reisen durch Syrien, Palästina, Phönicien, die Transjordan-länder, Arabia Petraea und Unter-Aegypten (in German). 2. Berlin: G. Reimer. Wikimedia Commons has media related to Caesarea.